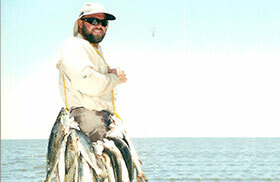 The fall speckled trout season here at Bayou Log Cabins Fishing Lodge is started to get heated up. This weekend we had a group of police officers and their wife’s in for some Memphis Tenn. There main gold was to do some fishing and have an enjoyable time with their wife’s. Ironically, we also had a judge and his wife along with a very good friend in from Birmingham Alabama. They didn’t know one another at the start of the weekend, however by the end of the weekend they were sharing fishing spots, food as well as many other things. By the end of the weekend it was through they had all come together. We started off Friday morning at safe light. 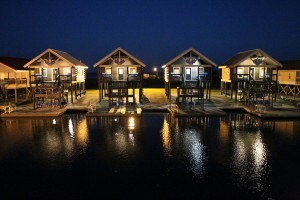 As normal I picked my customers up from the cabins and headed south towards Barataria Bay. We had a stiff wind out of the east northeast at about 10mph. The water was a little stained and it was falling. What all that means is that it was not the best of conditions. It was a beautiful sunrise and the girls enjoyed the ride out to the first fishing spot. It didn’t take me long to relies that they knew how to fish because we started off catching a few throw backs and I saw early on that they knew what they were doing. That made me think that all I had to do is find some decent size fish and they would do the rest. We had to move around a little bit early that morning, but we ended up finding some nice speckled trout and they did just what I through they would. We filled a box up with some very nice fish and had the time of our lives while doing so. Even when we were catching some throw back or unhooking a few catfish we seem to be always laughing and cutting up. It made my job very easy fishing with them. When we got back to the cabins I dropped them off and before I started to clean the fish they were on their way over to help me clean the fish and all the post clean up activities that needed to be done. It was such a pleasure to fish and hang out with folks like that. 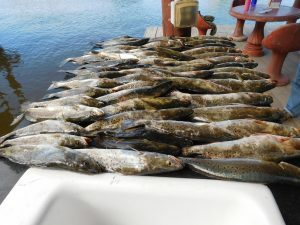 We had a two-day trip so the next day the forecast called for a little more wind and I was a little worried about finding some speckled trout the second day. However, when I pulled over to the cabins to pick them up the wind was calm as can be. We talked for a little bit about the conditions and came up with a new game plan to go out to the barrier islands where we been catching trout all summer long. Normally by this time of the year the trout have left the oyster reefs and started their transition inland to the shallow bays. 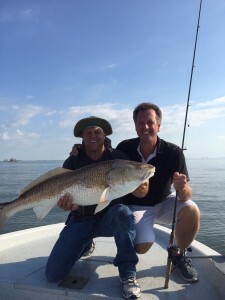 We took a chance and headed across Barataria Bay and the conditions were much better than I anticipated. 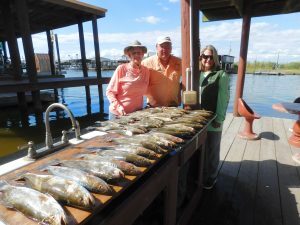 We caught another box of beautiful speckled trout and in the mix of catching the trout we caught and released several bull reds. Funny how even though we were targeting speckled trout only and we got into a bunch of big reds we were having just as much fun catching and releasing the reds as we were putting the big speckled trout on ice. That is what I call spending the day on the water with folks that know how to have an enjoyable time no matter what is on the other end of the line. Well, the same thing happens the second day as well with all the chores of cleaning the fish and washing everything down after the trip. That night the police officers in the other two cabins asked everyone to come over for a fish fry. Keeping in mind they were fishing out of their own boats. 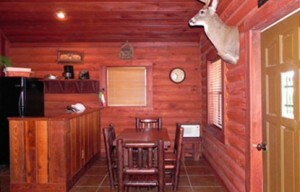 This is not the first time they have stayed here at Bayou Log Cabins Fishing Lodge. 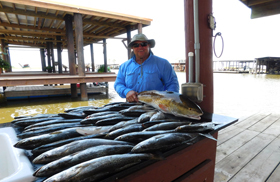 They know their way around here very well and know where to catch some beautiful red fish. Well as I was saying the last night before everyone left we had a fish fry under one of the log cabins and it gave us a chance to talk about all the things that happen during their stay. We had lots of stories to tell and many funny stories were told. The police officers mostly focus on red fish because many of the days they were here the wind was blowing fifteen to twenty-five miles per hour. 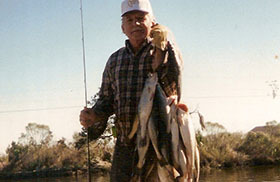 They really could not get out to where the speckled trout were because of the wind. Good thing they knew where the red fish were, and they even showed me a couple of great redfish holes that I didn’t know about. Just goes to show you that no matter how much you know about an area, you can always learn something new. I cannot say enough about those officers and their wife’s regarding there hospitably. They are truly some of the nicest folks you ever want to meet. You always hear me write about how important it is to get your head in the right place before you go fishing. What I mean by that is you should always tell yourself that the time you spend on the water should be time spent building memories and not so focus on catching a box of fish. 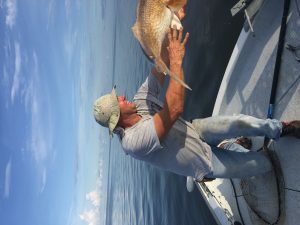 If you are so worried about catching a bunch a fish, you could easily miss out on all the wonderful things that happen along the way while on the water. Take the time to notice all the wildlife as well as the marine life you will see while on the fishing trip. Take lots of pictures to capture the moment as it is happening. 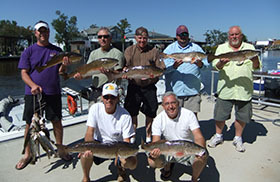 It will give you something to look back on when you are telling your friends and family about the vacation you had when you came down to New Orleans Louisiana on a fantastic fishing trip.